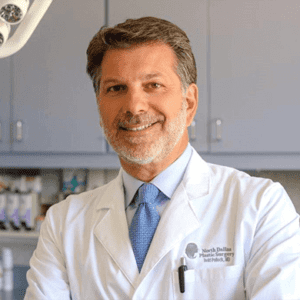 The practice of plastic and cosmetic surgery is extremely gratifying and I am pleased when I am able to make a difference in patients’ lives through surgery. 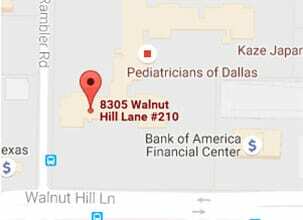 Whether it is correcting a deformity, enhancing one’s natural features, or repairing a defect from injury or cancer surgery, I am always honored when residents of Dallas and Allen trust me with their care. This procedure simplifies tummy tucks, greatly reducing surgical complications, improving results, and shortening convalescence. We have been using this technique over the past 30 years and have found it to be reliable and long lasting. 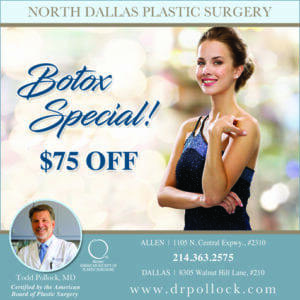 Get $75 off Botox treatments at North Dallas Plastic Surgery in February! Call (214) 363-2575 to schedule an appointment. significant challenge for all surgeons. As a cosmetic surgeon, dealing with patients who undergo elective surgery, I want my patients to have the best experience possible. A big part of having a good experience is minimizing pain and getting people back to their normal activities as soon as possible. Traditional post-operative pain control has centered on the use of narcotic pain medication. But there are many negative effects of this type of medication that may set patients back rather than speed their recovery. Common side effects of narcotic (or opioid) medications include nausea and vomiting, itching, lethargy and urinary retention to name a few. Addiction is a potential risk, but short-term use that is typical with cosmetic surgical procedures makes this risk minimal. More recent concepts of pain control following surgery have placed opioids in a secondary role in favor of using a variety of medications and techniques to attack pain at different points along the “pain pathways” from the site of the surgery to the spinal cord to the brain using non-narcotic medications. This has been termed multi-modal analgesia. There are a variety of medications used; some whose common use isn’t pain control at all. Combining this pain control with nausea prevention are the fundamentals of a concept called Enhanced Recovery Programs. While there are wide variations, multimodal analgesia looks something like this: some oral medications such as Gabapentin (an anti-seizure medication also used for pain) and Celebrex (an anti-inflammatory) may be started a day or more before surgery. The anesthesiologist may give a variety of anti-nausea drugs before and during surgery. 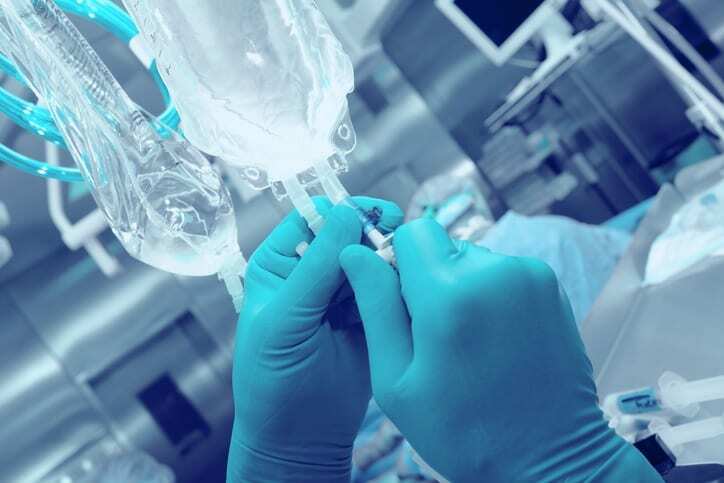 They may also put various medications in your IV early in surgery such as a low dose of a steroid that has been shown to have long lasting effects on pain. During surgery, long acting local anesthetic is injected into the tissues at the surgical site and nerve blocks may also be done. Exparil is a new long acting local anesthetic that may be effective for up to 3 days. Unfortunately, it is fairly expensive. After surgery, we have found Celebrex to be a game changer in pain control. I give it twice a day for two to four weeks after surgery and have seen a remarkable decrease in post-op pain and quicker recovery. In some procedures like tummy tuck, compressive binders or garments can be very helpful at not only controlling swelling, but also giving support and decreasing pain as the patient becomes more active. This is only one example, but many other drugs are being evaluated. Post-operative pain control has come a long way when we look at it in a completely different way. This is just one way we try to make the surgical experience better at North Dallas Plastic Surgery. 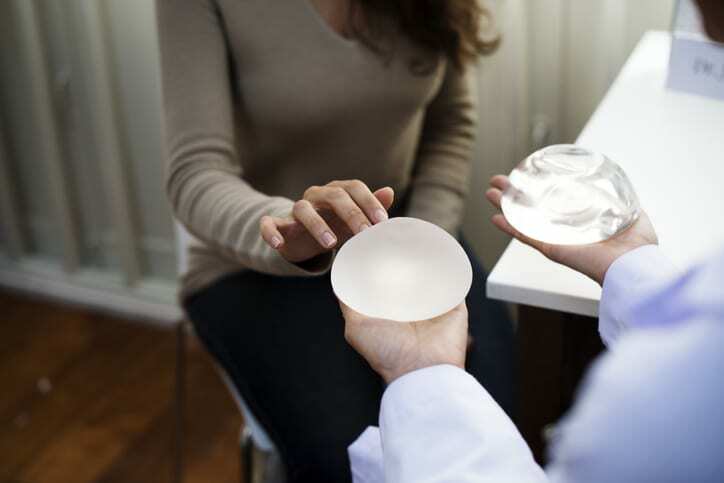 Recent news stories and talk shows have reported on a cancer that has been associated with breast implants. Needless to say, this has sparked a number of calls to our office. Here is a summary of information on the subject to give you a better understanding of the disease, the risks, its diagnosis and treatment. It is important to understand that this is a very rare form of cancer. Each year, over half a million breast implants are placed, just in the United States. There are only around 400 confirmed cases of this breast implant-associated cancer worldwide. That makes the estimated risk to an individual who has breast implants 1 in 30,000. BIA-ALCL typically presents as a fluid collection (seen as tight, painful swelling) around the implant that develops many years after implant surgery. The average time from implantation to development of symptoms is around 7-8 years. In most cases, treatment is curative with removal of the implant and surrounding scar capsule. 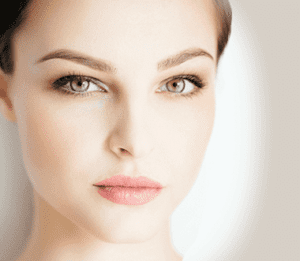 In many cases, a smooth implant can be placed immediately. Unfortunately, there have been more advanced cases requiring additional treatment and there have even been a small number of deaths. In women who currently have breast implants and are having no problems, there is nothing that need be done. No governmental agency (e.g. FDA) or medical association (e.g. ASPS, ASAPS, AMA, ACS) have recommended preventative implant removal. If you have any concerns, you should contact your surgeon, or I would be happy to set up an appointment to answer any questions. 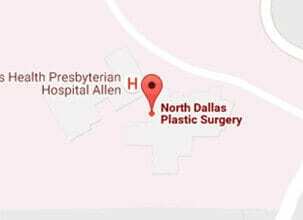 American Society of Plastic Surgeons member since 1998. The American Society for Aesthetic Plastic Surgery member since 2002. D Magazine Best Doctor recognition in 2009, 2010, 2013 and 2014.